The tour starts in Kathmandu. We appreciate that people join redspokes tours from all over the world and no matter what time you arrive at the airport on the tour start date, you and your luggage will be transferred to your hotel. Please bear in mind that if you arrive before midday you may have to wait for your room to be available. If you decide to arrive before this date redspokes can assist you in booking your accommodation and will organise a transfer to your hotel at an additional cost. Our holiday price does not include your international flight to Kathmandu, or your local flight from Kathmandu to Lhasa. The tour ends in Kathmandu. Please feel free to book your flight for anytime on the departure day, as you will be staying in Kathmandu for the last night of the trip. Your transfer to the airport is included in the price with redspokes. If you decide to stay in Kathmandu beyond the last day of the tour redspokes can help you organise extra accommodation and transfers to the airport if needed. If flying from the UK Gulf Air and Qatar Airways appear to be the favoured airlines by our customers. Check out www.expedia.com or www.opodo.co.uk for an idea of times and prices. You must be in possession of a valid passport. A 30 day multi entry visa is required for Nepal, which can be obtained on arrival and costs $40US. All tourists visiting Tibet require a valid China visa and a special Aliens Travel Permit, which they can obtain only by joining tours organised by recognised travel agencies. redspokes will arrange your Tibet visa which can be collected and paid for in Kathmandu the cost is $100US to $185US depending on nationality. In order to do this we will need a copy of your passport at least 40 days prior to the tour. It is a condition of joining our trips that you must be adequately insured. All persons are expected to arrange their own insurance. Policies should cover any potential risks involved in a mountain cycling holiday. In the event of requiring an emergency rescue redspokes will assist you in making arrangements. All costs are payable by the client which should be recoupable through your insurance. Please note the costs can be substantial. We ask for details of your policy to be entered in your redspokes account. We strongly recommend that you take out adequate cover for your bike and belongings. All the time you will have the security of a back-up vehicle, either a 4WD land cruiser or truck. 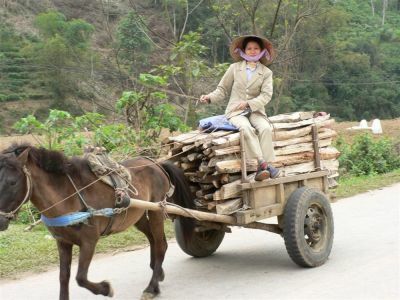 The vehicle will carry our entire luggage and you when needed. Our leaders carry a good tool kit and will help to fix any bike problems. However, we cannot guarantee that we will be equipped for all repairs, so you must ensure that your bike is in good working order before the tour. If in doubt, have it fully serviced by a bike shop before you travel. This trip is designed for the experienced cyclist. The distances and gradient each day are not extreme, but the altitude and terrain make this a tough trip. Along with the Karakoram Highway, this is arguably the most spectacular and varied mountain scenery in the world. This trip is designed for strong cyclists. 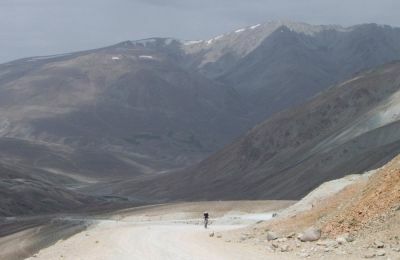 You will cycle over six high passes, five over 5000m. Altitude, headwinds and long climbs all contribute to making this one of the hardest tours going. 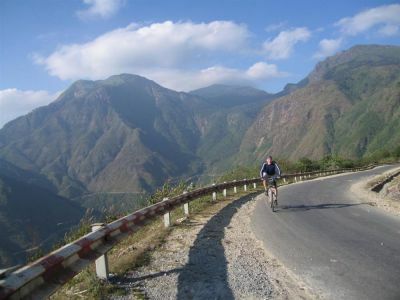 Most of the time you will be cycling on roads at altitudes over 4000m. Although you do not need to be an athlete, it pays to spend some time before the trip getting into the best shape possible. This will ensure you get the most from your holiday. We can send you specific training tips on request. Tough because bikes can take a hammering on Tibet's roads. Low geared: a 22-tooth granny cog on the front crank driving an 11-32/34 block on the back will do the trick. Comfortable as there are some long days so it is essential your saddle and riding position are right. A mountain bike is a good option. Front suspension will help with the washboard tracks and potholes, but it is not essential. Full-suspension is okay, but may be hard work on the tarmac stretches. If you have flat bars, fitting bar ends will give you a different hand position and help with the climbs. Touring bikes. The trip can be done on a traditional touring, but it is important to ensure it has got strong enough wheels, sufficiently wide tyres (37mm is about the minimum) and low enough gearing. It's worth investing in a pair of 36 spoke, hand-built wheels, using a good quality rim (e.g. Sun Rhyno, Mavic or Rigida). The route is a mixture of good road, poorly maintained tarmac and very rough gravel tracks. The best tyre for the job is probably the Schwalbe Marathon XR. It's very tough and hardwearing, and has a decent tread for the gravel without being too knobbly for tarmac. We would advise the following: multi tool, tyre levers, pump, 2 spare inner tube, spare spokes of the correct length to fit your wheels - check with a bike shop, brake pads, a few spare links for your chain, spares for any unique or high-tech items on your bike, e.g. fluid and bleed kit for hydraulic brakes. Please ensure that your bike is in good working order before you join the tour. If you are not the most mechanically minded person we suggest that you get your bike looked at by a professional bike mechanic. In particular we would suggest looking at and adjusting all wheel spokes, greasing all your bearings, checking your brakes/gears cable, tighten all nuts and bolts, check chain, quick release clamps, tyres, put in new inner tubes and check wheel rims are not worn. In addition make sure the bike is well serviced and ride it with as much care and attention as possible. For this tour we have Trek Excalibur and Marlin bikes (or similar) in a range of sizes. They are mostly new for this season and all are well maintained bikes with Shimano components and suspension forks. Spare parts (tubes, tyre, chains etc.) are included in the price of the bike rental and will be carried in the support vehicle with a tool kit and track pump. The bikes are equipped with flat pedals. If you prefer to use spd or clip-in pedals, you are welcome to bring these, along with your own cycling shoes and cleats. You are also welcome to bring your own saddle. The guide will carry some spares and tools for fixing punctures etc. but we suggest bringing a couple of spare inner tubes (26 x 1.75), a pump and a puncture repair kit. If you are able to do a simple repair yourself this will avoid the need to wait for assistance should the team or support vehicle be any distance away. Helmets are not included in the bike hire, you will need to bring your own helmet. Good quality waterproof jacket, waterproof trousers, warm hat (thick fleece), sun hat, cycle mitts, warm gloves, mountaineering gloves (waterproof outer, fleece inner) are good, mid-weight fleece top, 2 pairs of cycling tights (looser, "trackster" fit rather skin-tight lycra), shorts, long sleeved shirt, travel trousers, 2 wicking tee-shirts (synthetic or merino wool), cotton tee-shirt for around town, long sleeved thermal top, thermal long johns, 2-3 pairs underwear, 2-3 pairs of standard socks, 1 pair warm socks, cycling shoes, e.g. SPD's, trekking shoes, flip-flops, crocs or sandals to wear around camp. To avoid causing offence we recommend that you wear baggy shorts in preference to tight lycra as in some remote areas locals will not be accustomed to the sight of tightly clothed cyclists. Other suggested items are: bike helmet, dark glasses (the sun is very strong), small day sack or pannier (assuming you have a rack to attach it to) to carry clothing, camera and valuables, a couple of spare passport photos, photocopies of key documents e.g. passport (data and visa pages), travel insurance policy, airline tickets, camera, photos of your family and postcards of your town to show the locals. You will need a four season sleeping bag for this tour, which can be hired in Kathmandu. Your bike must be carried as a part of your luggage allowance; we do ask you to make every effort to keep your total check-in baggage to an absolute minimum. Whether you hire or bring your own bike, the bike must be carried as a part of your luggage allowance on the internal flight from Kathmandu to Lhasa. The baggage allowance for most airlines for an economy-class ticket is 20kg per person; although a degree of flexibility is usually extended to groups and the check in staff may accept up to 26kg per person without imposing excess baggage charges. During the trip, the group will spend 13 nights in hotels or guest houses and 11 nights camping. All accommodation will be on a twin share basis; If you are traveling on your own, single rooms/tents are sometimes available at extra cost. We choose accommodation on the basis of comfort rather than luxury. All food is provided on tour, except in Kathmandu, Shigatse, Gyantse and Lhasa, where you will need to pay for your lunch and evening meal. We recommend that you bring a supply of your preferred energy/snacks/drinks for cycling days. All transportation and local guides within Nepal and Tibet are provided. When you arrive in Kathmandu (on the first day of the tour) you will be met and transferred to our hotel. Our holiday price does not include your international flights to Kathmandu or Lhasa. A 30 day multi entry visa for Nepal can be obtained on arrival and costs $40US. redspokes will arrange your Tibet visa and a special Aliens Travel Permit, which can be collected and paid for in Kathmandu the cost is $114US or $198US for USA passport holders. Spending money depends on your taste for souvenirs, drinks etc. We estimate that £350 ($600) will be more than enough to cover the 26-day tour. International departure tax is around £18. Tipping is an accepted part of everyday life, and although it is always at your discretion, you will be expected to tip to reward service. £35($50) for the guide and team at the end of the tour is recommended. 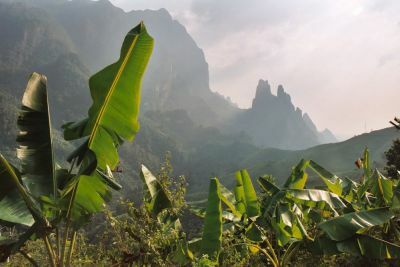 Altitude sickness is the effect of the thin air at great heights. Travellers to Tibet may suffer some discomfort like breathlessness and headaches before becoming acclimatised. As Lhasa lies at over 3680m, you are likely to experience some of the minor symptoms and discomfort of altitude sickness (headache, mild nausea, loss of appetite) until your body adjusts to the elevation. This can take from a few hours to a couple of days, depending on the individual. Take it lightly, but drink plenty of non-alcoholic liquids. Proper hydration is critical. "As an experienced cycletourist used to self-planned and supported trips, and who had never been on an organised trip before, this was a new experience for me. I was very..."